Make cookie dough as directed on package. Roll dough into 32 (1-inch balls); place in greased muffin cups. Press each ball in bottom and up side of muffin cup. Bake at 350°F for 12 to 15 minutes or until edges just begin to brown. Cool 20 minutes. Remove from pan; cool completely. Mix cream cheese, milk and powdered sugar with electric mixer on medium speed until smooth. 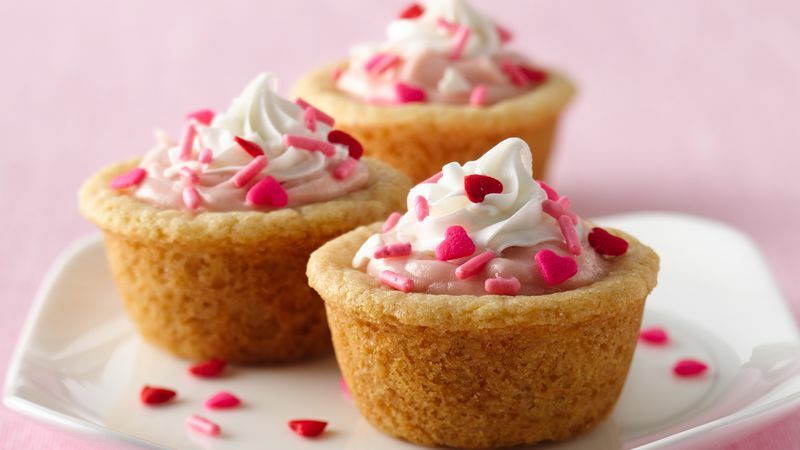 Fill each cookie cup with rounded teaspoonful of filling. Top each cookie with decorating icing and sprinkles. Store in refrigerator. If you only have one 12-cup mini muffin pan, shape all of the dough into balls. Fill the pan and cover the remaining balls to keep them from drying out. After baking, cool the muffin pan completely before refilling it with dough.